A 4.8-magnitude earthquake struck on Wednesday in the area near Europe’s most active volcano Mount Etna, injuring several people, damaging buildings and forcing the partial closure of a highway, Italian civil protection authorities said. Two people were rescued from a collapsed building and around 10 were taken to hospital suffering light injuries from falling debris. One elderly woman suffered multiple fractures, while 18 other people made their way to the hospital on their own to be treated for minor cuts and shock. The region consists mainly of small farm towns and vineyards. 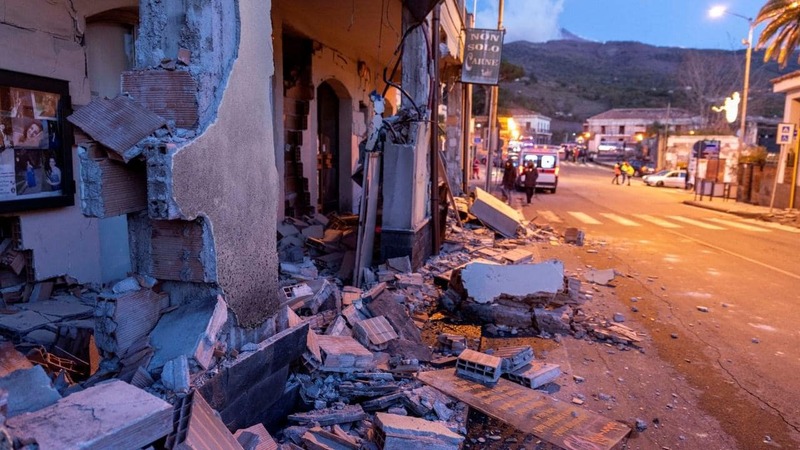 The quake was the region’s strongest since Mount Etna erupted on Monday, spewing ash and forcing the temporary closure of Sicilian airspace. The national institute for geophysics and vulcanology (INGV) said the quake hit at 0218 GMT at a depth of 1.2 kilometres (0.75 miles). Despite the partial closure of a coastal highway, an airport at the provincial capital Catania was still operating. The epicentre was located north of Catania, where several families spent the night in the streets. The quake toppled the bell tower of the Santa Maria Santissima del Carmelo church in Acireale, including its statue of Saint Emidio, traditionally believed to protect against earthquakes. Monday’s eruption occurred on the side of Mount Etna, the first lateral eruption in a decade. Mount Etna is 3,300 metres (10,800 feet) high, and has erupted regularly over the past 2,700 years. The most recent eruptions occurred in early 2017 and its last major eruption was in the northern hemisphere’s winter of 2008-2009. The INGV said that the quake’s epicentre was almost exactly where a 6.3-magnitude quake hit on February 20, 1818. Italian authorities have now stepped up surveillance on the volcanic island of Stromboli, part of the Aeolian islands northeast of Sicily, which began spewing bits of lava on Tuesday.